I’ve had a pretty interesting response from my post a few weeks ago about my New Year’s resolution to eat a whole pig and blog about it. I’ve had offers to host a joint pig-roast (Thanks, Mikey P… We need to make this happen). I’ve had people tell me that they are going to mirror my experiment. I’ve also had people tell me that I’m crazy. One of the things that I’ve been thinking about is how do I document this tremendous feat of porcine consuming strength. (Side Note: I have no idea if it is, in fact, any sort of feat. For all I know I eat like 3 pigs in a normal year. I guess this is one of the reason’s why I’m doing this). One of the biggest thoughts that ran through my head after my initial blog post was how to measure such a feat. So, here are the rules. If you take the whole pig, nose to tail, that will give you about 160 lbs which includes great stuff like the hocks, soup bones, lard, liver, jowls (like bacon), head, trotters and other things. The pig is good to eat, end-to-end. For the purposes of this experiment, when I speak of eating a whole pig, I am talking about a 150-160lb butchered pig. I am going to try to eat all of the consumable pieces including trotters, offal, lard, and tail. 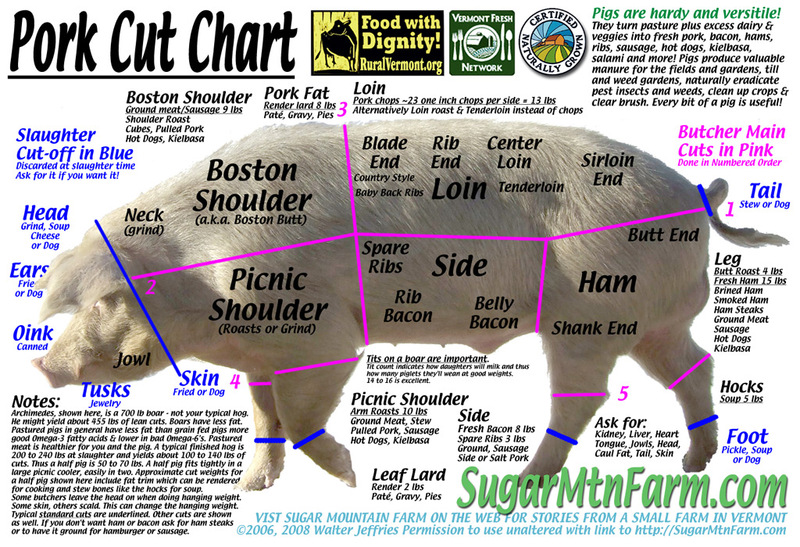 Here’s the breakdown of the pig… and what I’m going to attempt to eat. I rounded some of the numbers down in my favor- Hey, I’m the one eating a whole pig, not you. The more I look at this, the more I question whether or not it can be done by me. I mean, my goal is not to do some crazy Man vs. Food type stunt. I genuinely want to know how much pig I eat. I also want to concentrate on the cuts that are not very popular. I guess what I’m saying is that I doubt I’ll be able to eat 2 whole pig’s legs (28lbs of ham), but I’ll make sure that I concentrate on the weirder cuts instead. I feel like eating a pig brain has to count for like 10lbs of ham in this little experiment. If anyone is having a pig roast and wants a part-time blogger to help out, let me know! Also, if anyone wants to help me make headcheese, I’m looking for someone to share this experiment with. I don’t think Mrs. Notafoodie will be too much help in shaving a pig head. What about the non-consumable pieces? You can’t let that go to waste! Find a creative use for a pig skull (perhaps as the head on a walking stick, or replace the hood ornament of your car with it). You can use a pig’s bladder to make a football. We save the skulls to get the tusks and sometimes mount the skulls too. Bones go to the dogs and then to the compost pile. The bones decompose completely and add valuable nutrients to our gardens. The guts go to the compost pile too when we slaughter and again creates wonderful compost. Same for pigs that die on the farm and are not otherwise edible. An 800 lb sow in the compost pile is just a grey stain in a few months and then rich dark soil amendment. Glad you enjoyed the chart. I continue to update it time to time. Keep eating the pig end-to-end! @Sloanerb- First off… good to hear from you… secondly, I forgot to add the digestive tract to my list… maw and all! Thanks. I know some people who shave a pig head every morning. I know you’re not talking about me… I grew a beard just for that reason. What about pig’s feet? I’ve seen them in the grocery store before, so I know people consume them. Personally, they don’t look too appetizing to me. I’m sure I’ll find some trotters along the way. If you know of any good pig feet recipes, send them along!